The Spiraea ‘Gold Flame’, Spiraea x bumalda, is easily grown in average, medium wet, well-drained soil in full sun to part shade. It tolerates a wide range of soils. Prune in late winter to early spring. 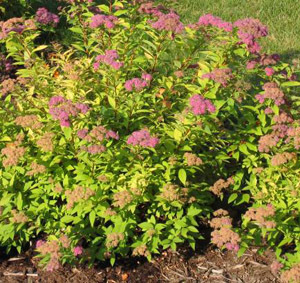 Gold Flame Spiraea cultivar is a dense, upright, compact, mounded deciduous shrub which typically grows to 2-4' tall with a similar spread. Profuse pink flowers in small corymbs cover the arching stems of this plant in late spring. Flowers and leaves all appear on the same side of the arching branches. Flowers are attractive to butterflies. It has narrow leaved, dark blue-green foliage. It has no serious insect or disease problems, and is effective in borders, foundation plantings or hedges.